A Behind the Scenes Look at Sourced Co.
A strong design doesn't just fall into your lap. It’s something that takes time and creative energy to develop. And, as a lot of us have experienced, the final design usually isn’t exactly what you had in mind to start. Rather, it’s a version of it that worked because of props, lighting, photography or just dumb luck. Here at Sourced Co., we practice a few things that not only help us develop a final design we can be jazzed about but produce a final collection of styled stock photography that inspires others. And, one of those things is incorporating sketching into our design process! Shout out to Mary for helping other creatives learn and practice this skill! We absolutely think it is important and here’s a behind the scenes look at our design process to show you why. Probably like most of you, we start our design process by creating a mood board. It acts as the creative brief of sorts to guide all of us towards one aesthetic goal. And, along the way, we constantly refer back to it to make sure we’re on track with colors, style, and general mood. This is an especially important part of our process since we usually are building concepts that are out of the actual season we are in. So, it helps to keep our eyes looking forward as opposed to being distracted by the trends going on all around us. Next, we sketch! Sometimes, the sketches are more like scribbles (hey, real life) but sometimes, we take the time to do it proper sitting down with pencils, paints, markers and all to create an initial concept sketch to start bringing the mood board to life! Another shout out to our girl Breesa Lee for creating the concept for the rad backdrop you are going to see more of in just a bit! In addition to that, we usually incorporate drawings and paint washes into our custom stationery elements, so this is the phase where the computers get put down and the pencils get picked up. The part in between drawing things out and the actual photo shoot is a bit of a whirlwind; with the four of us going out to divide and conquer! We source all of our props and shoot locations. We design and print our custom elements. We fill our homes with #allthethings to pack and bring to shoot day. And, along the way, that mood board and concept sketch work to keep us all in check. In the end, we end up with a collection of stock photos and graphics for wedding and creative professionals to use to inspire their own work! How do you use sketching in your design process? We (and Mary) would love to know! We are delighted to share with you this amazing summit! Shining a light on Charm City and the brands that live and thrive in Baltimore, OUTSPIRE Brandwise 2018 is an exclusive conference experience unlike any other. If you’re searching for an alternative to the typical business seminar, this unique one-day branding summit is sure to inspire you and your team. Hell, bring your boss too! Geared towards professionals, creatives, and entrepreneurs, OUTSPIRE 2018 includes education, networking, and entertainment - a fully immersive experience designed by creative powerhouse STEPHANIE BRADSHAW. Gain the edge in your industry by learning the value of communicating your brand identity rather than implementing the same old marketing strategies. OUTSPIRE’s expert panel of speakers share their highly-coveted advice on how to build balanced brands, develop an authentic story, and position your business for success. Join others just like you on Wednesday, August 15, 2018 at REVOLUTION EVENT DESIGN & PRODUCTION, and meet brand leaders from Condé Nast, Jack Daniel’s Craft & Luxury Label, Stanley Black+Decker, and more! The Warehouse After Party at OUTSPIRE 2018 immediately follows the one day summit and is included in the all-day conference pass. Busy during the day, but want to join us at night? Tickets for the after party are also available for purchase separately at outspiresummit.com. It feels extra good to connect with creatives in our own backyard and that’s exactly what we did in our San Francisco East Bay class last November. Event planners, designers, and fellow creatives joined us at the new and upcoming Kinfolk Inspired Space (KIS for short) for two days of sketching, networking and creative introspection. We were treated to a beautifully designed space by April Baytan Designs. April was inspired by her Filipino heritage and her beloved Grandmother. She incorporated vintage lace and velvet linens, with textured florals in a romantic palette of blush, taupe, ivory, and burgundy with pops of ripe mango. Pampas grass provided an element of soft movement in the arrangements, while orchids and garden roses gave an element of romance and decadence. Moreover, April’s design provided ample opportunity for our students to master the texture, floral, and draping lessons – a win-win all around! These design elements provided skill honing opportunities throughout the two day class as Mary lead students from one-point perspective on day one to two-point perspective on day-two. Day two builds upon the texture lessons, draping lessons, and one-point perspective lesson and brings them all together in a much harder, yet more rewarding fashion in day two, that being two-point perspective. This perspective is much more true-to-life and the sketches created on day two are certainly worthy of a client presentation and styling for Instagram. Not to be outdone, the sugar flowers and well-dressed draping adorning the cake, by Pretty Please Bakeshop, made their own remarkable statement. The cake stand was white ceramic with a simple gilded band, which sat upon a rattan buffet, creating a secondary focal point in the room for students to sketch. Another thing we love about our local classes is how it allows us to invite our national sponsors to join us in class. One of those sponsors was Carey with The Idea Emporium, who not only created the delicately and delectably assembled menus, name cards, and invitation suite, she also gave our students a lesson in styling their sketches for social media. Students learned the behind the scenes tricks, tools, and rules that Carey uses to showcase her work in stunning fashion. It was a marvelous two-days and we can’t wait to do it again. Our 2018 Tour has kicked off and is in full swing. Check out our list of tour stops to see if a class is coming to a city near you! Hello, TSS Fans & supporters!! Thank you for your continued support of The Sketchbook Series. I can't believe that it has been 5 years since we started our first ever live sketching luxury workshop. Over the years we have been encouraged and supported by this wonderful creative community. We’ve seen so many of you grow and stand confident in your creative power and we are overjoyed that we get to play a part in that. If you've been considering signing up for The Sketchbook Series live 2-day tour - this is the year to do it! We have 3 incredible remaining stops this year! Please help us spread the word about our workshops or feel free to message us if you're interested in any of our remaining cities! Each class requires a minimum of 10 attendees in order be hosted. These classes take a lot of energy and effort from not just myself, our team, but all of the local partners involved, and we’d hate for you all to miss it. In order to focus on creating the best experience and new curriculum, we have decided to limit our tour stops and take San Diego and St. Louis off the tour list this year. We apologize to those who were eager to sign up for these cities this year, but our business and brand is evolving and we have some exciting new releases this fall, so please make sure to stay connected with us by adding your name to our newsletter! We are so grateful for this community and we want to stay connected with you on what more you want to learn! If you're interested in signing up - check out the remaining 3 tour stops in 2018 and remember to sign up early to secure your spot! We have group rates and payment plans available so please inquire at [email protected] and one of our team members will be ready to assist you! We were so thrilled to team up and partner with the fabulous Nuage Designs! Check out the article below, also featured on Nuage's Blog. We are excited to have them for some of our tour stops this year as well as be a part of this sketch to reality concept board! Leave us a comment below if you already do sketching for your client presentations!! When it comes to designing weddings and events, there are a lot of tools out there. Whether you piece together mood boards or curate Pinterest boards, making sure your client can understand your ideas can be the difference between booking the gig or losing it to someone else. So how do you make sure you can relay your creativity in a way that’ll have your client saying “I do!”? Sketching! Cue Mary Phan, founder and creator of The Sketchbook Series & Very Mary Inspired. Mary launched The Sketchbook Series to inspire and guide creatives on their journey towards turning their ideas into realities, leveraging sketching as a tool to aid communication through the design process. We’ve both attended and sponsored many an event with The Sketchbook Series and are always reminded what an asset it is to have this skill. From Nuage Designs: "We had thoughts of Bougainvillea and bright blue ikat print on the mind. Mary combined our Cobalt Marrakesh and Natural Wood Verona Chair with table top pieces from Casa de Perrin and floral inspiration shot by Lucy Cuneo to sketch up this tablescape. Just right for an al fresco lunch!" From Nuage Designs : "A graphic black and white palette accented with gold details was just the thing we had in mind. Mary set the table with our Black Sedona and Gold Soho Chairs and paired it with black and white pieces from Casa de Perrin, really amplifying the bold geometric effect. To soften the look, she took inspiration from a mossy terrarium arrangement by Kelly Elissa Events & Enchantment Floral." Anyone else ready for summer? Don’t we know it! Mary brought out the tropics in her sketch with our Beverly linen paired just for the outdoors with our Oak Chairs. Tabletop pieces from BorrowedBlu added a modern touch while florals inspired by Ashley Elizabeth Designs kept everything refreshingly cool. Want to learn about the process and see some more beautiful sketches Mary created for us? Click here to keep the creativity flowing! Reminder: Don't forget to have fun! Interested in our purchasing our Basic Sketch Kit? You can purchase it HERE. FYI, we offer a sketchbook in our sketch kit, not the watercolor pad as shown above. Hope you enjoyed the video tutorial! Leave us a comment below and remember to share with us your finished pineapple sketch on instagram. Can't wait to follow along in your sketching journey! Tag your photo with #tsspineapple in your caption and tag the photo with @thesketchbookseries & @verymaryinspired, Can't wait to see your pineapple sketches!! Level 1B’s lesson was getting attendees to think in a different view or perspective. We built in lessons for attendees to sketch tabletops in a 1 point and 2 point perspective. Here are some testimonials from our attendees..
Before you knew it, lunch was served. This time a chic picnic style and presentation is so important to us! Aren’t these cute picnic lunches just the most precious thing? When thinking about details for your clients’ experience, personalization is always the key to making them feel special. We ended the day with a styling lesson. All participants had a chance to bring their sketches into new light and got to style some instagram photos as proof that they worked hard here @thesketchbookseries ;). We are so grateful to have the support of our National Sponsor, our incredible local partners, and attendees for having @thesketchbookseries to Dallas! We cannot wait to see where all these amazing designers take their ideas from here!! For more information, sign up to our newsletter and follow us on instagram Here. We recently caught up with Carey amidst wedding season and in between her celebrations on her recent feature in the fall issue of Martha Stewart Weddings of her very own wedding. This candid chat reveals her quirks as unique as her designs, both of which we adore. This gal has been busy with married life, cuddling with Preston her cat, and running uber creative wedding branding company- The Idea Emporium, which is also our national sponsor. We have been planning for months. 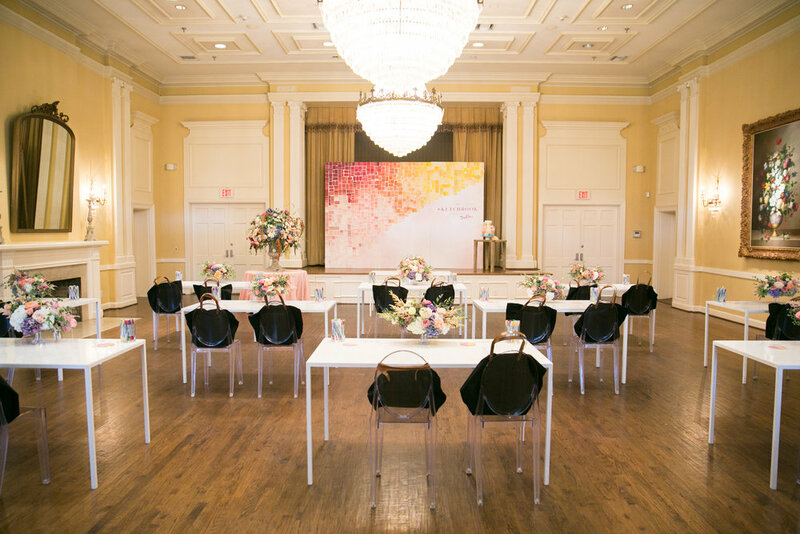 Emily Clarke Designs team really took the inspiration to a new visual height on 8/21 & 8/22 held at the lovely @arlingtonhallatleepark. Our Dallas class was well attended by elite designers, planners, event designers, florists from as far as Pennsylvania to Louisiana. Hard to believe that our Mexico sketch class was just last month, but wanted to share some of the amazing details from this class! First of all, how can you not be inspired by this amazing setting and location? We were dare we say, spoiled from beginning to end by some of our favorites vendors! Our hosts @dreamsrivieracancun + @marialimon made our trip SO SO amazing!! And our wonderful photographer, Enrique Leon from Agencia FVS was there to capture it all! Guys, we're telling you - the hospitality in Mexico is by far the best in the world!! Maybe this is why we keep coming back!! Eddie Zaratsian, mastermind behind Eddie Zaratsian Lifestyle and Design, chats with The Sketchbook Series ahead of our first workshop of the year at The Huntley Hotel in Los Angeles, CA. While Eddie will be taking a deeper dive into his business, as well as the in’s and out’s of the industry during the workshop, we’re excited to share some of his background and foundation to his story. We're thrilled to have The Sketchbook Series - San Francisco featured in Smitten Magazine! To get to the full article CLICK HERE and don't forget to check out all the amazing people who helped put our first The Sketchbook Series class of 2016 together! Our last day began bright and early. My class was part of the opening session at 9AM. I’m always so excited to meet new people. We had close to 65 attendees, and The Breakers provided us with a wonderful cake to sketch. It was a 45 minute lesson that allowed some of our group to get a taste of how to start a sketch.